Having fresh tomatoes in the garden is one of my favorite things about having a garden! Although our summer garden is winding down, we have had a great amount of tomatoes this year. What better way to use up some of the tomatoes than canning them into a variety of different things like sauces, salsa, and juice. We use tomato juice a lot during the winter months. Well in other months too. But we make a lot of chili, Spanish rice, stuffed peppers, goulash, etc in the winter that the canned tomato juice is nice to have. 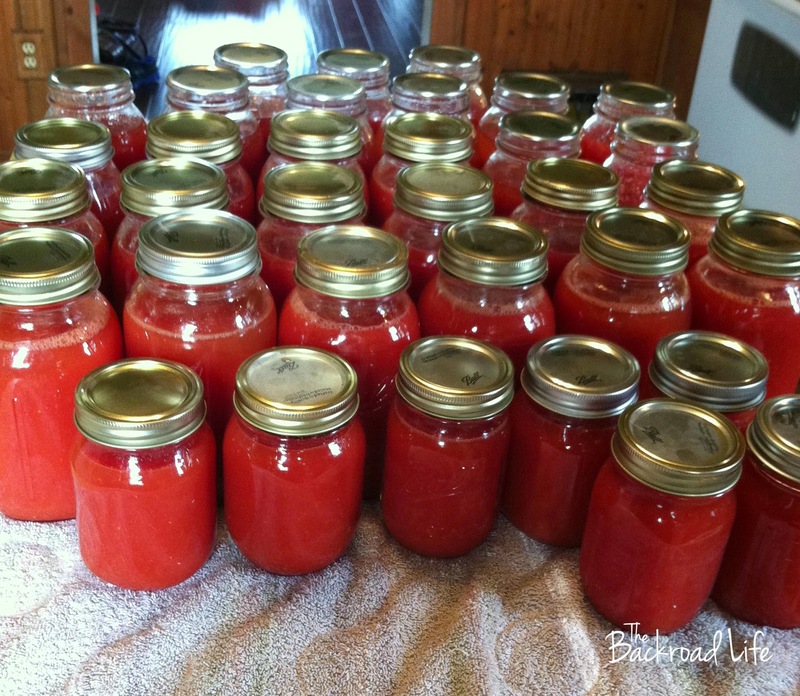 This season, I canned several quarts, a few pints as well, of tomato juice and this last weekend, I did my last batch for this year. 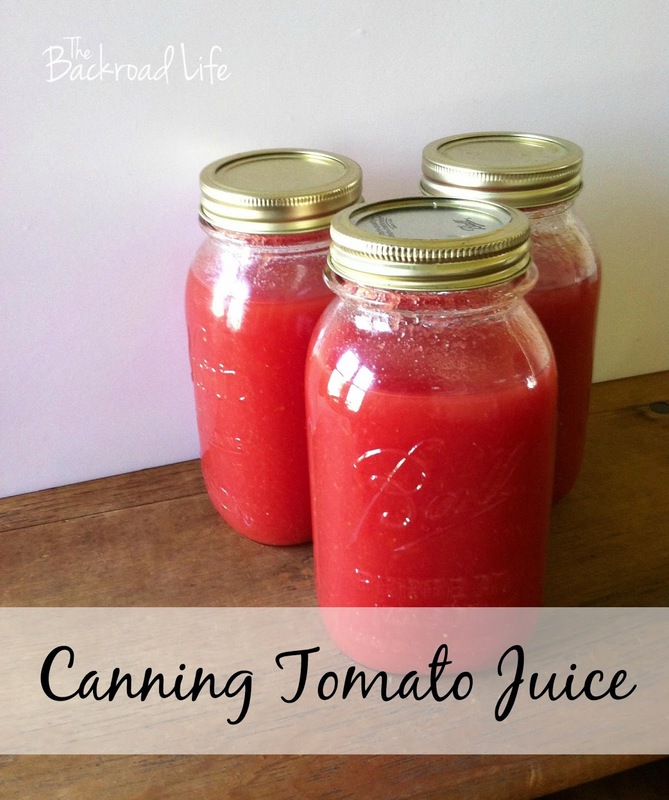 Canning tomato juice takes a bit of effort and work, but once you are done and enjoying it in the winter, you will be glad you did! -Pick tomatoes that fresh, ripe, and firm. 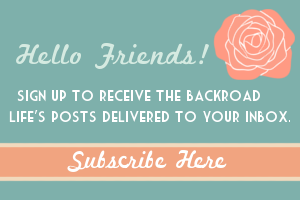 -Have your clean and sterilized jars ready to fill. Be sure to check your canning equipment. Remember canning safety during your canning process. 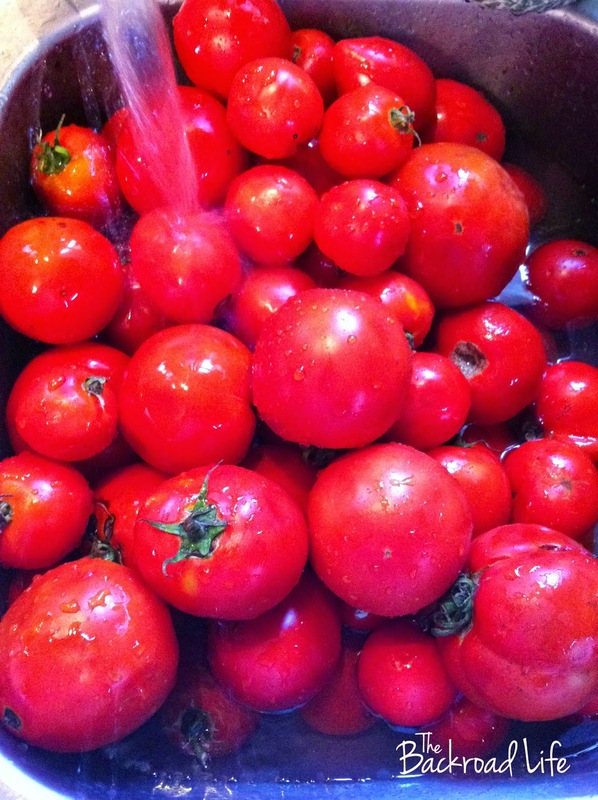 -Prepare your tomatoes by washing them, coring them, and removing any bad spots if they have any. 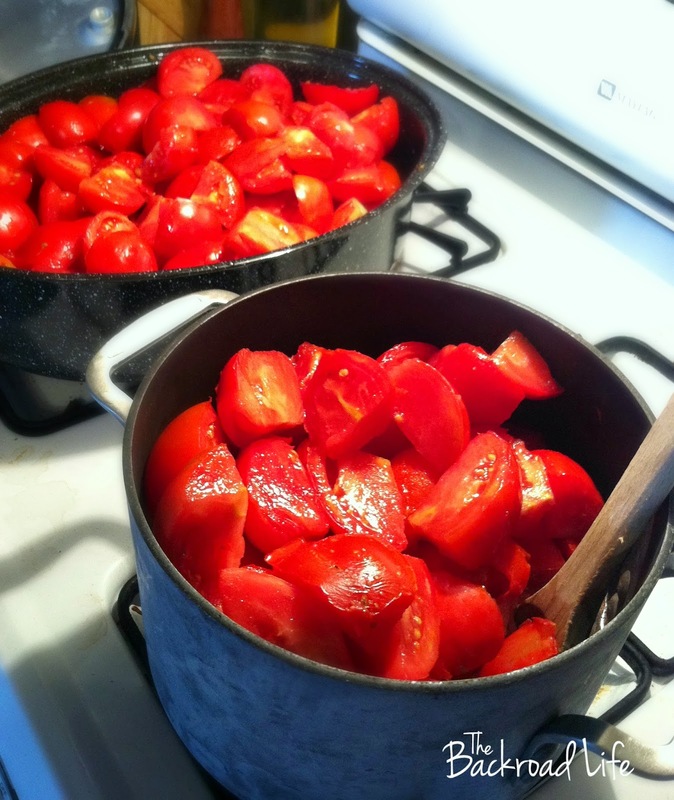 -Cut your tomatoes into quarters and place in a stock pot on the stove. -Set the burners on high and start to cook down your tomatoes. 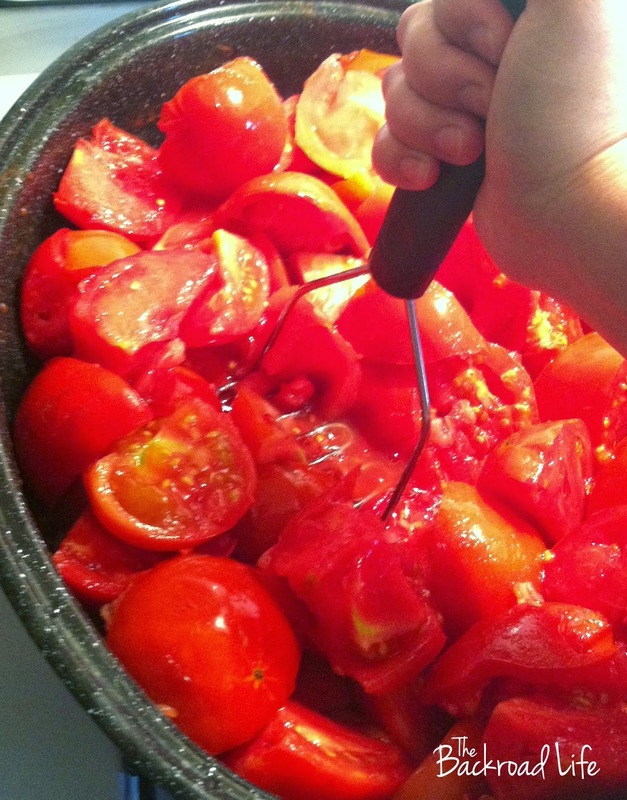 I smash some of the tomatoes at the beginning to create some juices at the bottom of the pot to prevent burning. 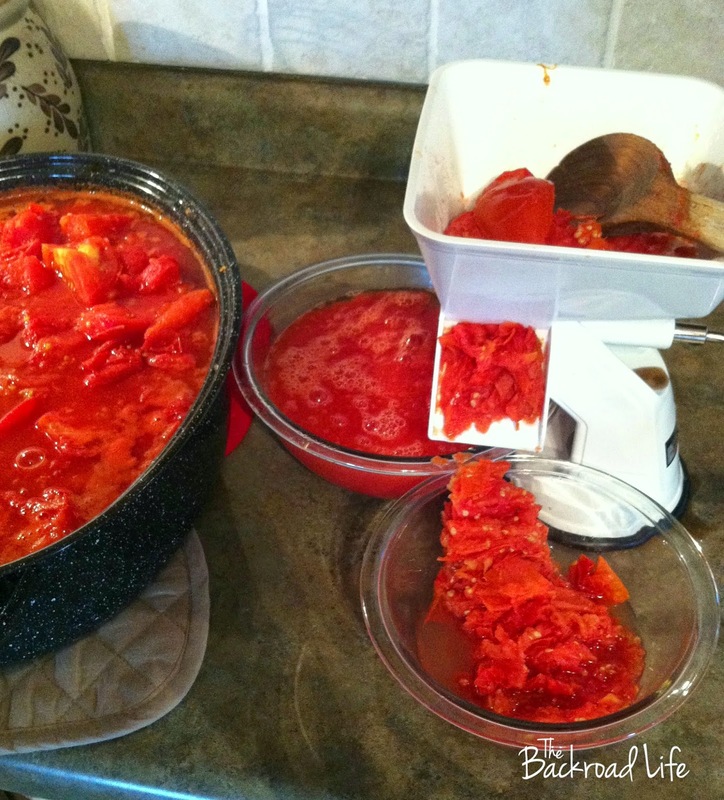 - Once the tomato skins start to peel off and the tomatoes become tender, remove them from the heat. Here is where the food strainer is so handy to use. 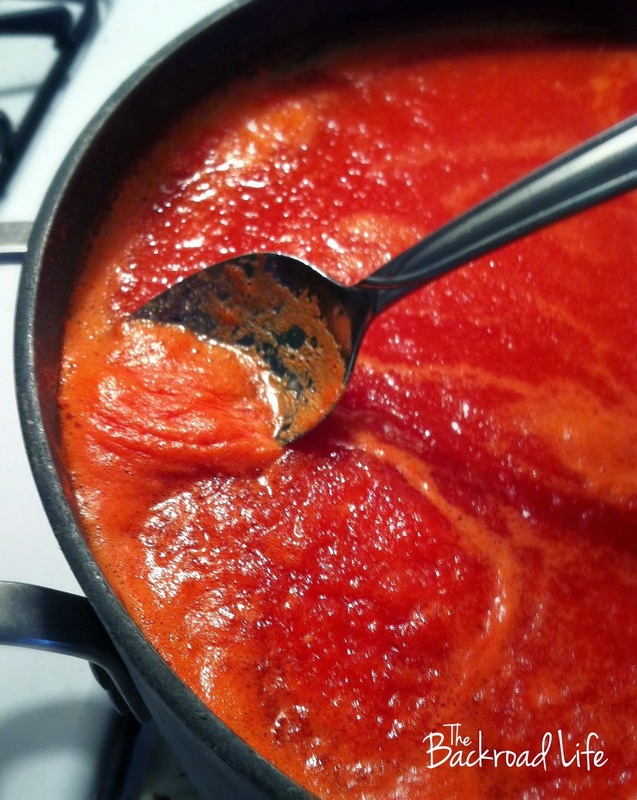 I simply use a ladle and put several scoops into the hopper part of the food strainer, turn the crank, and this separates the tomato juice from the skins and seed. The juice flows out one spout, while the skins and seeds goes out the other. I continue to do this until my pots are empty of the quartered tomatoes. -I run my bowl of peels and seeds back through twice to be sure to get as much juice from them that I can. - As I fill up my bowl with juice, I dump it back into a stock pot on the stove. This will be the finished product of juice that will go in the jar. -Once the pot is full of freshly squeezed juice, bring the pot to a rolling boil. As it boils, the juice will bubble up and form frothy areas. I simply remove that with a spoon. 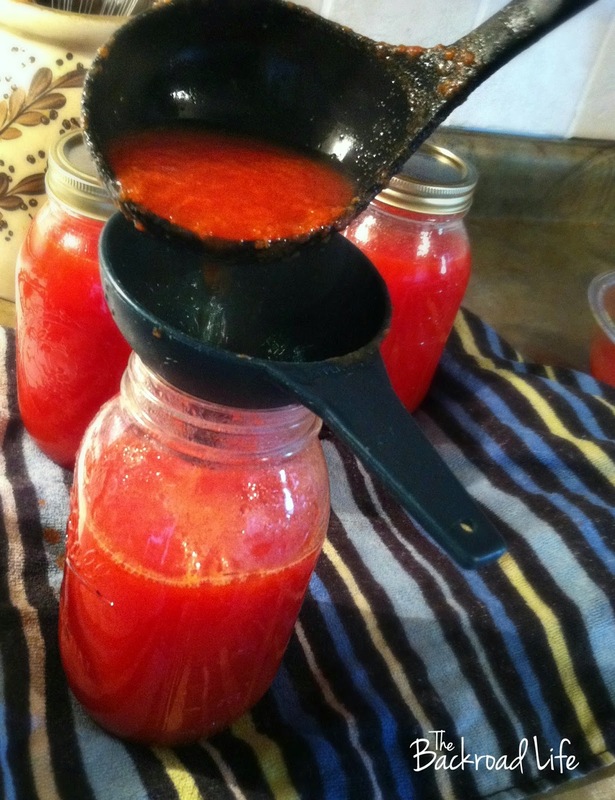 -I use a ladle and funnel to pour the juice into my jars. Be sure to leave 1/2 inch headspace at the top of the jar. While filling the jars, I have my lids in boiling water on the stove to sterilize them before putting on my jars. -Use a towel to wipe around the rim of the jar. This removes any tomato debris that would prevent the lid from sealing. Place the lids on the jars and screw the ring on tightly. -Next, place the jars in the canner. I have a Presto canner that I use. Be sure to read your canner manual to see what it says for cook time and at how many pounds. For example, my canner says process at 11 pounds pressure for 15 minutes for quart jars. -At the end of processing time, turn the burner off and remove canner from heat. Let the canner sit and cool and the pressure drop to zero on it's own. This may take a while. Do not take the lid off the pressure cooker and do not quick cool. When the pressure of the canner has been completely reduced, you can take off the pressure regulator from the vent pipe and let canner set for 10 more minutes. Then remove the canner lid. Remove jars from canner with a jar lifter and place on a towel to cool and dry. When jars are cool, check seals by making sure the lids are not popped up, wipe jars down, label and store in a cool dry place. You can also remove the rings to use for more canning. After three full tomato juice canning days, one pictured here, we are ready for winter. 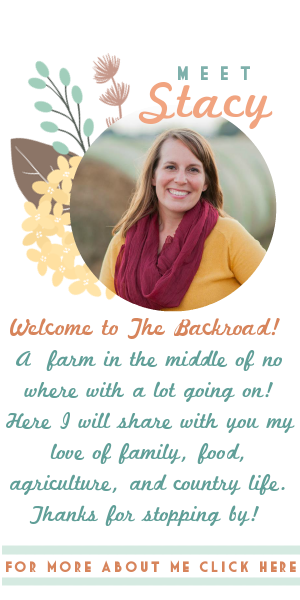 Happy canning to you!! 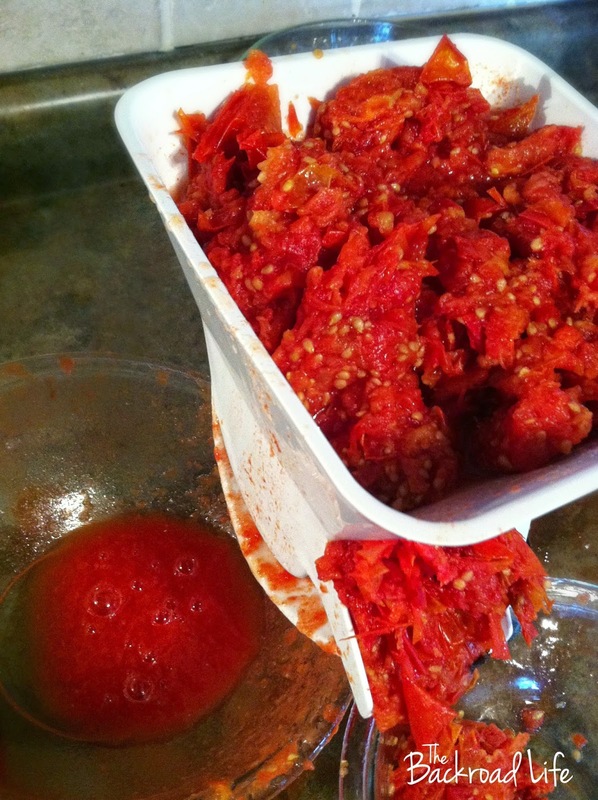 If you don't have a food strainer, you can also use a food mill and remove tomato peels before juicing them. 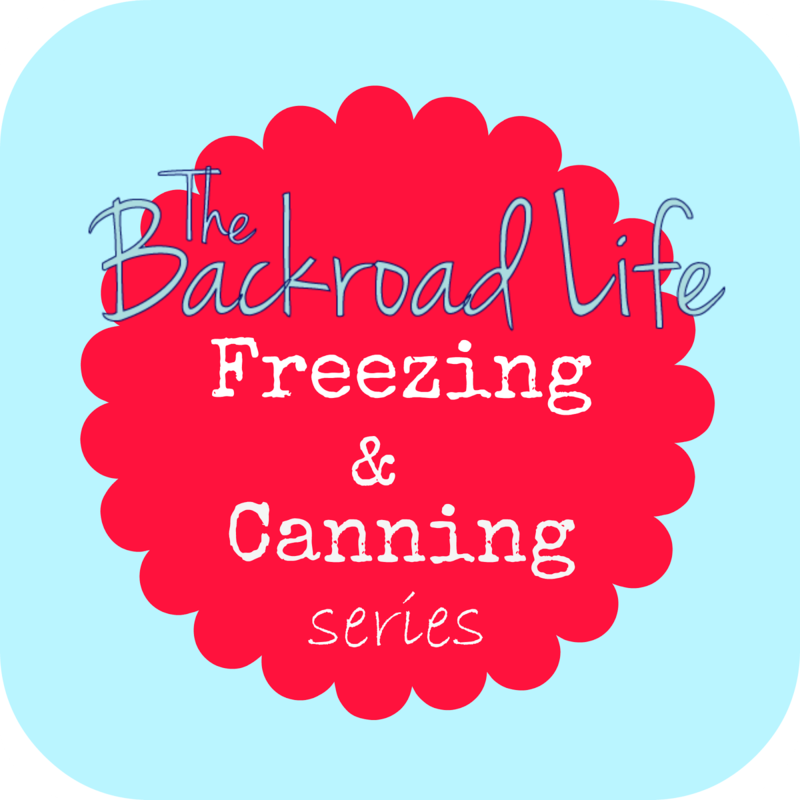 This post is part of The Backroad Life Freezing & Canning series.